On a visit to Cliveden while I was researching visual reference for the Buckinghamshire Clock which I made in 2000 I sketched one of the enormous plinth mounted terracotta Urns that adorn the garden. 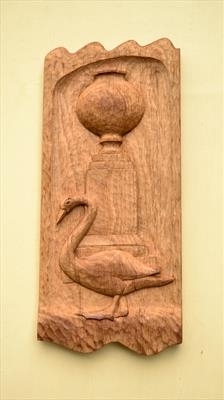 The Swan, being the emblem of the county, was naturally included.Though I made this piece some years ago it's time I showed it here. While I paint a lot of my wood carvings, occasionally I give a natural finish to the piece. I am using up a bottle of Tung Oil currently: I love its nutty smell and the hard, satin finish it gives. My sketchbooks with drawings gathered in support of bigger projects offer many little jewels that make smaller pieces like this.